This is the second in a series of 7 bulletins summarizing the methodology for and findings of the Growing up with Media (GuwM) Study. GuwM is a longitudinal survey of 1,586 youth aged 10-15 years at baseline. Data were collected initially between August – September, 2006, again between November, 2007 – January, 2008, and finally between August – November, 2008. The survey protocol was reviewed and approved by the Centers for Disease Control and Prevention Institutional Review Board (IRB). Data were collected across three time points:Data were weighted to match the U.S. Population of adults with children between the ages of 10 and 15 years. Adults were the weighting target because they were the recruitment target. A full report on the methodology of the GuwM study is posted here at the bottom of the page. As a result of data cleaning activities, the final sample size for Wave 1 is 1,581 (See the Methodological Details bulletin for more details). One of the most common pieces of ‘Internet safety’ advice is about the importance of parental monitoring, including the use of filtering and blocking software. Less commonly suggested, but perhaps equally important, are simple things like talking to your children about what they do and see online. In this report, we examine the frequency of household rules related to types of media. We also examine trends across time (i.e., Wave). …although the presence of Internet household rules tended to decrease over time. The most common rule that parents had is restrictions on where their children can go online, including chat rooms, X-rated websites, etc. This rule was not only the most common, but also the most stable across time. Also reported by a majority of parents was the requirement that children have their chores, school work, and other responsibilities fulfilled before they could go online or use the computer. Endorsement of most rules decreased over time. The most notable decrease was the requirement that their children ask permission before using the Internet. At Wave 1, nearly 3 of every 5 parents had this rule, but at Wave 3 less than 2 of every 5 parents had this rule. These decreases were largely explained by the increased age of the cohort over time (see Figure below). The overwhelming majority of youth (84-92%) also reported having Internet household rules. This question was only asked of child respondents who had home Internet access at Wave 1. As shown in the previous table, there was strong convergence between rules reported by youth and those reported by their parents. The most common rule youth reported was the same as caregivers: a restriction on specific places online where youth were not allowed to go. Similar to caregivers as well, the majority of youth said that they had to finish their chores and school work before they could go online or use the computer. However, data in the table above shows that more youth reported a lack of rules over time: compared to a stable 7-8% of parents, we see a doubling of youth who said that they do not have rules over time, from 8% at Wave 1 to 16% at Wave 3. About 3 of every 4 parents who have household Internet rules almost always enforced them. Certainly, to have rules is one thing, but to enforce them is another thing. The vast majority (66-71%) of parents who have household rules about Internet use reported that they almost always enforce those rules. An additional 1 of every 5 reported that they often enforce those rules. 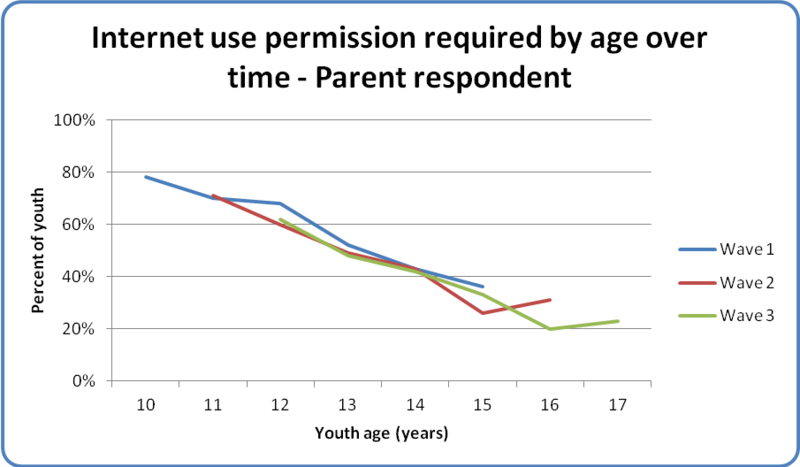 Concurrently, about 3 of every 4 youth who had household Internet rules almost always followed them. As shown in the table above, youth were overwhelmingly likely to report that they follow the Internet household rules. Thus, even though reports of individual household rules tended to decrease over time, youths’ tendencies to follow existing rules remained relatively constant over time. Over 90% of youth played video or computer games; and about 4 of every 5 of these youths’ parents had rules about them. Unlike rules for the Internet, the most common rule parents had about games was a requirement that their children finish their chores and homework before playing. This is not to say that parents don’t care about content: about half of parents at Wave 1 said they had restrictions on the types and ratings of games that their children could play. These restrictions decreased over time however, with about 2 of every 5 caregivers still having these rules over time. Fewer than 5% of caregivers said youth were allowed to play certain games that the caregivers did not like as long as the caregiver was outside of the room. The most notable decrease in rules about video or computer games reported by parents over time was in the requirement of the child to ask permission before playing games. At Wave 1, more than 1 of every 3 parents reported having this rule in their home, whereas only 1 of every 5 parents reported having this rule at Wave 3. There were also notable decreases over time in parents allowing their child to only play games with certain ratings and not allowing their child to play games until household chores or homework were done. A lifting of all household rules related to game play was more common for older children; this was true across the three years of the study (see Figure below). 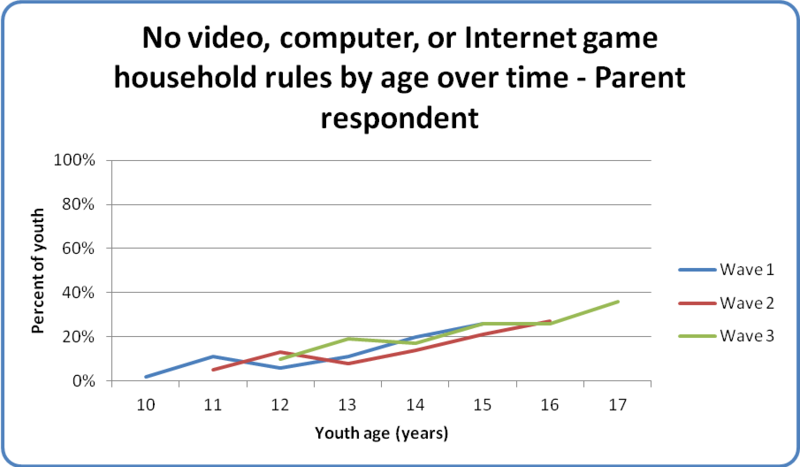 Youth-reported household rules for game play were similar. As with Internet rules, there was strong convergence between caregiver and youth report about game rules. Indeed, some rules were more commonly reported by youth: 55% of youth compared to 48% of parents at Wave 3 said that they were required to complete their chores and school work before playing games (see Table on page 6). Over half of parents who had household rules for their child about game use almost always enforced these rules. Slightly fewer parents reported almost always enforcing game rules compared to Internet rules, although more parents reported doing so ‘often’. Enforcement was stable across time, despite the aging of the cohort. 2 of every 3 youth whose parents had household rules about video, computer, and Internet game play almost always followed these rules. Youth were equally likely to report following rules as caregivers were to report enforcing them.